154 Hidden Court: Cherry Vodka Gummy Cokes. Oh yes I did. 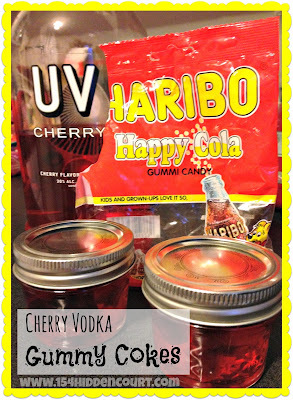 Cherry Vodka Gummy Cokes. Oh yes I did. One of my most visited blog posts ever is this one about vodka gummy bears that I posted right before Christmas, in an effort to keep you drunk and jolly for the holiday season. In truth, this doesn't really surprise me, because vodka laced candy sounds just exactly like what people would expect from and love about me. But now? Well now, I have outdone myself. I MADE CHERRY VODKA GUMMY COKES!!!!!!!! And O.M.G. they were good. Move in closer, grasshopper, and I will tell you more. 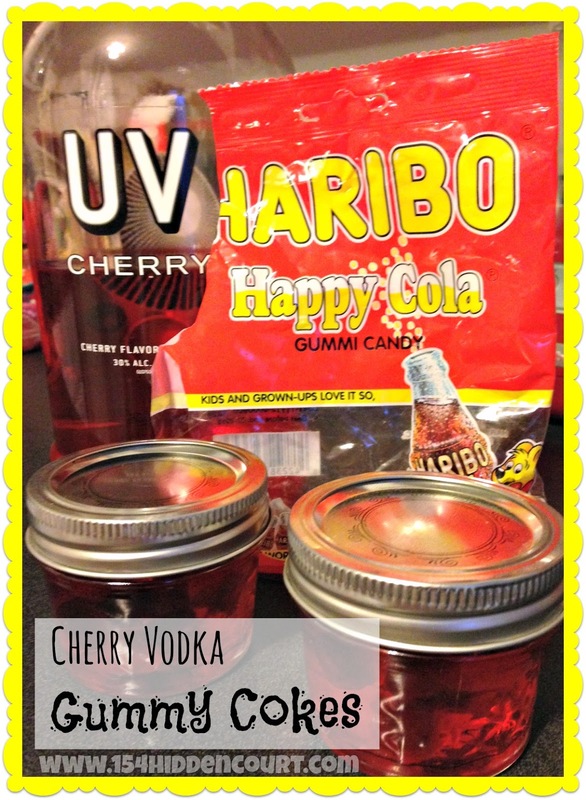 I used exactly the same method that I did for the vodka gummy bears, but (and here's where it gets interesting) instead of plain vodka I used UV Cherry Vodka, and instead of gummy bears I used gummy cokes. I filled a couple glass jars (with lids) about 2/3 full with gummy cokes, then I covered them just barely with the cherry vodka. I let them sit in the fridge for a couple days, then i added enough cherry vodka to cover them again. Then I left them alone for about a week in the fridge, occasionally taking the jars out to shake then up. They were ready to eat after a week. And oh my word. They were delightful, and they were dangerous. They had zero alcohol taste at all, and they tasted just like a cherry coke. Honestly, I'm a fan any time I'm able to get drunk off my snack. So get yourself up off the couch, put on some pants and go get some gummy cokes and some cherry vodka and make some of these things. Then you can sing my praises, and tell me how smart and ingenious and funny and cute I am. Really, I don't mind a bit. I'm using your gummy bear recipe right now. My bears are slowing getting drunk. Next I will try this one!!! Yummy gummy! I'm not sure you could call it a recipe, exactly... but they are yummy.